On ships, reliability of the equipment is of utmost importance. On-board repair and servicing hydraulic components at sea is costly and time consuming. Keep all on-board hydraulic, gears and lube systems perfectly clean by reoving generated dirt, absorbing wate and eliminating sludge and varnish. We maintain clean oil for diesel engines, thrusters, cranes, lubrication systems, winches and a broad range of on-board equipment. The smallest particles < 5 micron are particularly harmful and can cause a chain reactive wear. Consequently submicron sized resinous by-products from the oil degradation process (sludge and varnish) cause additional strain to the oil system and accelerate oil ageing. Water is very harmful. Keeping water out of the oil systems on ships is a continuous fight. Moisture and varying temperatures create ingression of condensate water. 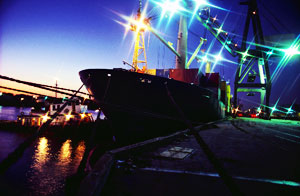 Triple R products protect critical hydraulic systems for wharf and loading docks supportinn marine vessels. Can be ATEX / EX certified.